I think the usefulness of this is the fact that we can not rely on Headshapes alone to classify what is or isn't Modern Human related. I stopped reading Diego's posts a long time ago. He's realy nothing but a Troll, and it ruined a good thread. Mit-Haplogroup N* is present in Italy (Paglicci) and Spain (el Pirulejo) since the Paleolithic, so it did not arrive here with the Neolithic farmers. Regarding conquests, violence, population substitutions, origin of the Basques, we have our own theories and we draw our own conclusions, which obviously are very different from those that apparently prevail in the Anglo-Saxon world. In general you have built a story adjusted to your preferences and I think we have made a more realistic interpretation fleeing from topics such as conquests etc ... But there is something obvious that no one can deny, none of the large calcolitic villages of southern Spain show signs of violence when they were abandoned. It was the exhaustion of the environment and the climatic event 4.2 that produced the changes. Where is the violence? In the minds of geneticists, these interpretations are very good for selling interviews and getting more funds to continue investigating. @Neil and Ric, the cool thing is that Salkhit sample has AMH mtdna, however those archaic features still need a lot of explanation. I'm guessing (hoping?) that they can NGS sample properly, and I would guess that we'll see a sample like an East Asian version of sample at Pestera cu Oase - lots of ancestry from outside AMH. It'll be really cool if the Salkhit sample is related to people who actually contributed some low, low level of this to East Asians (though this may not happen, as in Oase2 case), especially if this looks like it can explain the signal of a diverged Denisovan related lineage contributing introgressive variants in East Asia. We'll be able to make theories about R1b1a1a2 in Iberia better once we have access to all the burial context information for Olalde's samples. It is evidence that going by dating alone, some samples with non-R1b1a1a2 are about until at least about 1500 BCE, without steppe ancestry, and the co-existence of samples with R1b1a1a2 and steppe ancestry until this time. Until we have this information it will be too early to say. It may be that groups with R1b1a1a2 and steppe ancestry and pure descendants of Chalcolithic Iberians coexisted in some way in Iberia until this time. Where is that specific date deduced from ? I'm curios about the 'integration'' of the HG cluster in NW Europe. In the overview we see the position of the Dutch and British Beakers and then we see the modern populations like Norwegians, Swedes and the early Anglo-Saxon, on the same height but turned to the HG side, like Rise 98. So in the years after the SGC/BB there seems to be an integration of the HG, where there besides the TRB (neolithic) still some HG pockets around the North Sea?? @Dragos, Reich's presentations from late 2018. Go through my posts in other threads if you want to find a link to some graphics, or alternatively presentations in full are on Youtube. I fully agree with you, and I also hope that we will get an autosomal analysis of Salkhit. Supplementary Fifure 3 (https://static-content.springer.com/esm/art%3A10.1038%2Fs41467-018-08018-8/MediaObjects/41467_2018_8018_MOESM1_ESM.pdf) is very informative. We can see that there are many deep N lines, including R, in the Near East, West Asia, India, Southeast Asia, Australia and Northeast Asia. However, Salkhit is not under any of these lines that exist today and it has several private mutations. 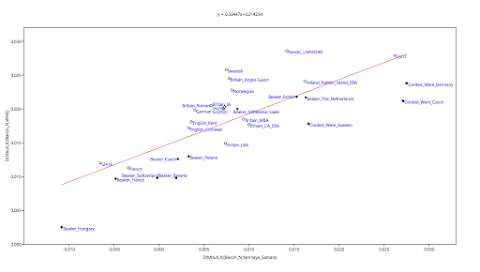 Moreover, it can be seen that while Oase1 is one step further away from modern N lines, including Salkhit, the mtDNA of c. 34 kya years old Salkhit is further away from modern mtDNA when compared with the mtDNA of Ust’-Ishim (45 530-40 610 calBCE) and Tianyuan (c. 37 kya) which are both under R.
David, there are already GAC genomes from Koszyce. It's a good opportunity to check if the Poles are late GAC plus early CWC. Thanks Matt. 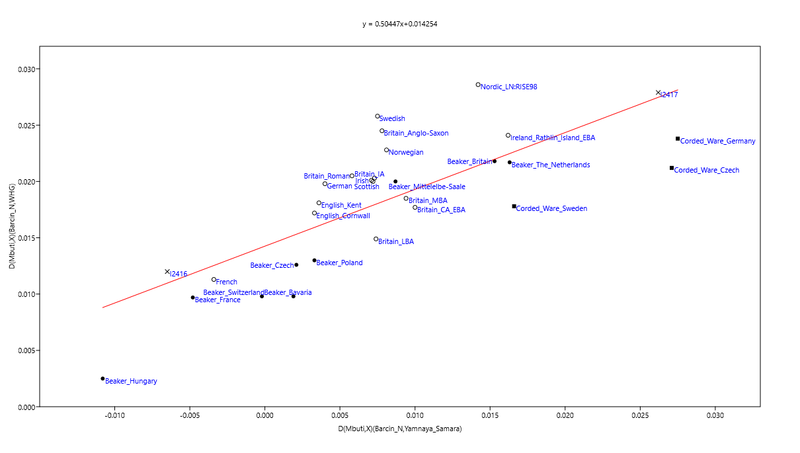 Going so far, it seems the caesura is c. 2000 BC (g or t), with a ~ 500 year overlap. It all coincides with the BB era itself. @Kristiina, thanks for that post - always very important to define the degree of basal divergence of uniparental lineages in these very ancient samples. Ahh.. Anatolia_N, so this sample is at least tangentially connected to your discussion, good. Do you happen to know what N subclade(s) are in Anatolia_N? - there are quite a few. You seem quite skeptical of Andrzejewski. Time travel, haha. But what reasons have you to be skeptical? Can you let me in the joke? No seriously, what evidence do you have that he is incorrect? That I can see. This specimen certainly highlights that human, morphological variation in this era was wider than believed. It also makes David's new rule " do not discuss or cite any outdated physical anthropology work unless it's just the raw measurement data" etc. seem all the more reasonable. By N* do you mean basal N - the specimen in question was said by Devièse's team to have no living descendents. Are they saying that the individual's branch of mtdna N did not contribute to any human population alive (or sampled?) today? Also what subclade(s) of N are in Italy and Spain and how do we know it didn't arrive with Neolithic farmers? @Matt and Kristina thank you for your informative comments, I'm starting to get clarity! 1. The yDNA. Does anyone know if Paabo's team have data on this? what could this specimen (Salkhit), tell us about human migration, that feeds into the discussion about European origins so eloquently explored here? Ps last thing (honest!) did they ever announce Tianyuan's ydna haplogroup? 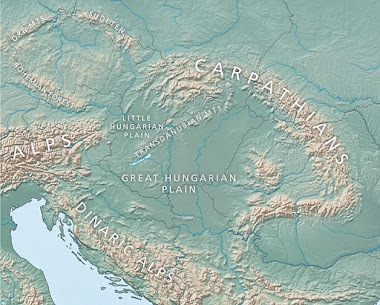 Haplogroup HV has been documented later in Paternanbidea (6,100 BC) and then throughout the Neolithic and Chalcolithic to the present. Imagine the type of conclusions if we only had the first or only the second individual (or couple like the first, and could like the second). I'm not sure what you mean? My conclusions would be essentially the same, because there are many British Beaker samples available. So compared to them, I2416 would still look admixed with southern ancestry, and I2417 would still look more Corded-Ware-like than the average.